It seems hard to imagine that the winner of the 2016 Presidential Election will not also win another important race… the social media race. In today’s hyper-connected world, the candidate that inspires enough of the population to eventually win the election will likely also have excited enough of the public to “follow” her or him on their various social media networks. With that in mind, I thought I’d take a snapshot of where the top Republican candidates are in today’s social media eco-system to see how each individual candidate fares against their competition (Democrats will be looked at in a later post). 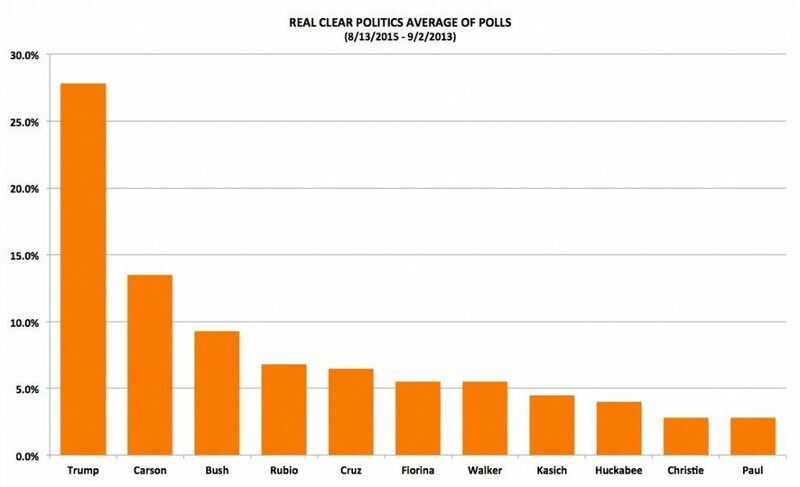 I limited the study to the top ten candidates in the Real Clear Politics Average of National Presidential Polls from 8/13/2015 to 9/2/2015 – with Chris Christie and Rand Paul tying for 10th place. You can see each of their standings in the poll below. I decided to limit review to the most popular and widely used social media networks, including Facebook, Twitter, and Instagram. As expected, Donald Trump is winning in Facebook Likes, with Ben Carson in a respectable second, as can be seen below. Bush is near the back of the pack while still holding the third spot in the polling. 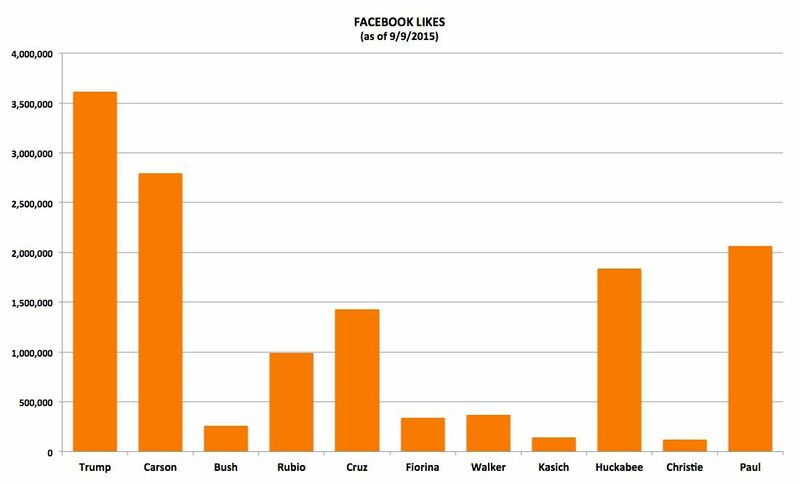 Also notable, both Paul and Huckabee have a respectable numbers of Facebook Likes, but are far behind in the polling. Next…Twitter. Like Facebook, I looked solely at the official Twitter profiles of the candidate’s presidential campaign. 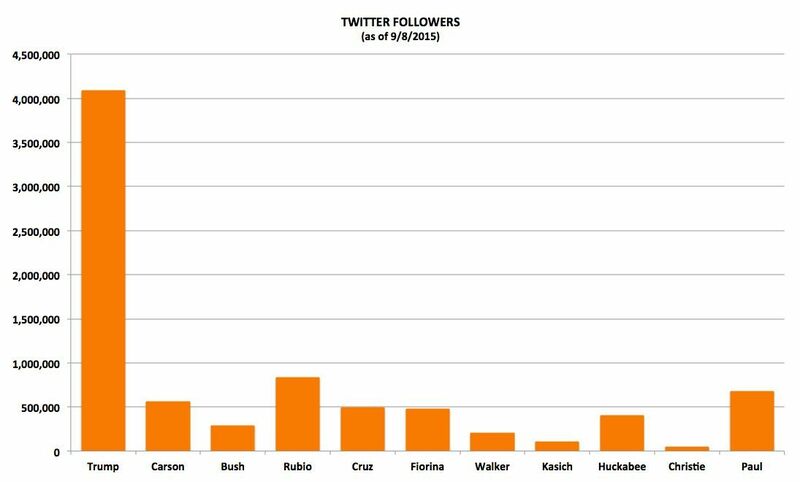 With 4.1 Million Twitter followers, Trump dwarfs his Republican competitors. In fact, Trump actually has more Twitter followers than all Republican Presidential candidates combined. This has helped lead to over 12 times as many Twitter mentions as Jeb Bush, who has the next highest mentions, as reported by Bloomberg News. Instagram does not tell a different story. 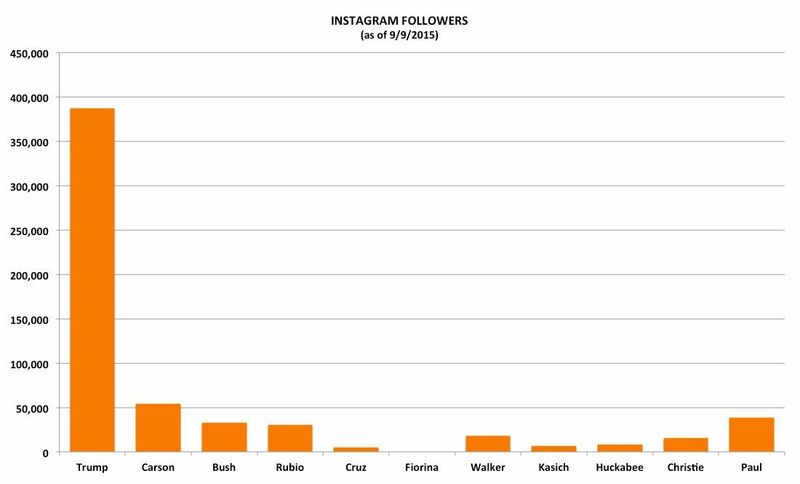 Again, with 387,000 followers, Trump has more Instagram followers than all of the other candidates combined. What does this all mean? At this point, it means that Trump has a considerably larger platform than all of his competitors to distribute his message directly to the public – and that is no small point. According to the Pew Research Center, a growing number of the general population receives news from social media networks. A candidate’s social networks can be thought of as a large pool of excitable and sympathetic followers that can influence their friends through sharing, posting, and retweeting. 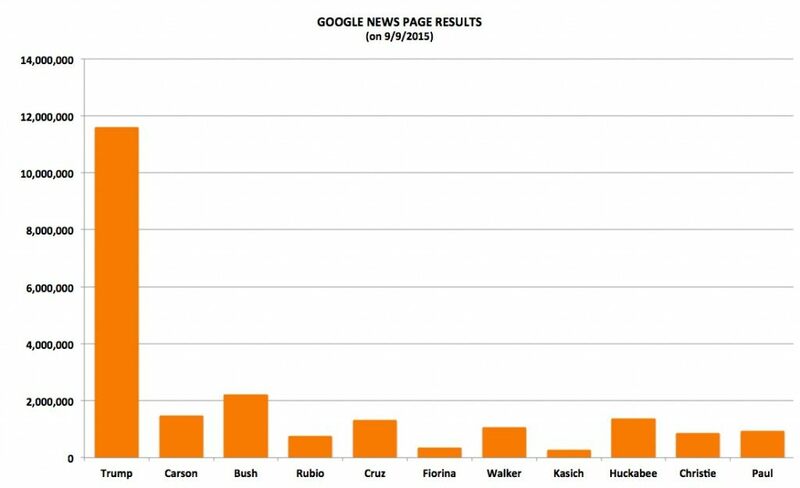 With by far the largest social media distribution platform, combined with a natural acumen for getting media attention, Donald Trump has been able to dominate the media coverage, web searches, and in comparison to his Republican competitors, web traffic to his campaign website. As can be seen from the following graph, “Donald Trump” as a web search term on Google towers above the top five Republican candidates. Trump’s social media network has undoubtedly also helped feed Trump’s online news coverage. Searching each of the candidates’ names in Google News provides the following page results, where Trump is dominating once again. With his growing social media footprint, Trump is becoming harder and harder to beat in the buzz game. Whether this translates into victories in the primaries or caucuses is a question that can only be answered with time. 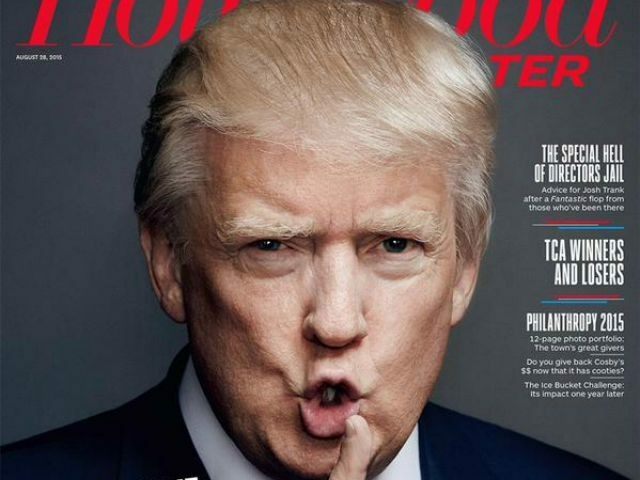 The next debate should show whether his social media dominance is going to continue. But three conclusions can be made from this data: 1) Trump is winning the social media race by more than a head of hair, 2) the other candidates better figure out how to replicate Trump’s success, and 3) if they can’t replicate it, they should get down on bended knee and pray they get mentioned by him, in almost any capacity. Patrick Courrielche has contributed to Breitbart since 2009. He can be followed on Twitter @courrielche.